Estimating the mass of these rings from the amount of light they reflect shows that each of these developing planets is at least the size of a few Earths, according to Carey Lisse, a planetary scientist at the Johns Hopkins University Applied Physics Laboratory (APL) in Laurel, Maryland. Over the past few decades, using powerful NASA observatories such as the Infrared Telescope Facility in Hawaii and the Spitzer Space Telescope, scientists have found a number of young debris disk systems with thin but bright outer rings composed of comet-like bodies at 75 to 200 astronomical units from their parent stars—about two to seven times the distance of Pluto from our own sun. The composition of the material in these rings varies from ice-rich (seen in the Fomalhaut and HD 32297 systems) to ice-depleted but carbon rich (the HR 4796A system). 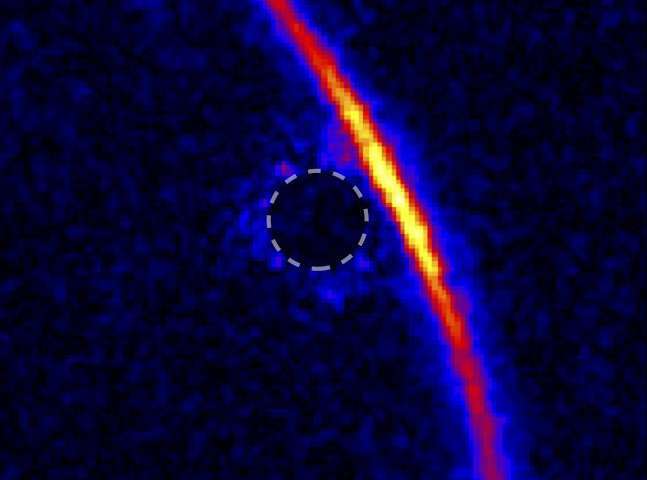 Presenting his results today at the American Astronomical Society's Division for Planetary Sciences meeting in Provo, Utah, Lisse said scientists are especially intrigued by the red dust ring surrounding HR 4796A, which shows unusually tight form for an infant solar system. Lisse traces the extreme red color to the burnt-out rocky organic remains of comets, a result of the system's ring being close enough to the star that they have all boiled off. The researchers don't see red ring dust in Fomalhaut or HD 32297, but instead see normal bluish comet dust containing ices—because these systems' rings are far enough out that their comets are cold and mostly stable. 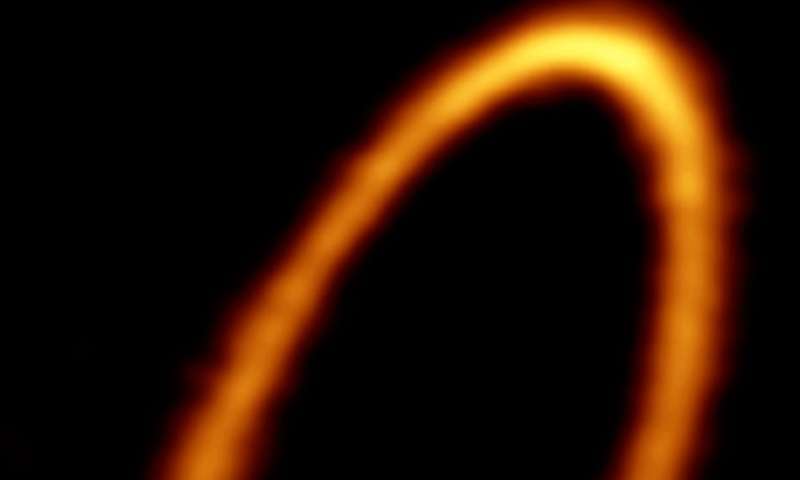 "The narrow confines of these rings is still a great puzzle—you don't typically see this kind of tight order in such a young system," Lisse said. "Usually, material is moving every which way before an exoplanetary system gets cleaned out and settles down so that planetary bodies rarely cross each other's path, like in our present-day solar system." After eliminating other possibilities due to the lack of primordial circumstellar gas seen in these systems, Lisse and his co-authors have attributed the tight structure to multiple coalescing bodies "shepherding" material through the rings. "Comets crashing down onto these growing planet surfaces would kick up huge clouds of fast-moving, ejected 'construction dust,' which would spread over the system in huge clouds," Lisse said. "The only apparent solution to these issues is that multiple mini-planets are coalescing in these rings, and these small bodies, with low kick-up velocities, are shepherding the rings into narrow structures—much in the same way many of the narrow rings of Saturn are focused and sharpened." This is a paradigm shift, he added, because instead of building a planet from one big construction site, it's coming from many small ones, which will eventually merge their work into the final product. Recent studies have yielded similar theories about the formation of the giant gas planets Uranus and Neptune, that each had multiple "subcores" that were eventually covered by thick atmospheres. In Fomalhaut and HD 32297, researchers expect that millions of comets are contributing to form the cores of ice giant planets like Uranus and Neptune—although without the thick atmospheres enveloping the cores of Uranus and Neptune, since the primordial gas disks that would form such atmospheres are gone. In HR 4796A, with its warmer dust ring, even the ices normally found in the rings' comets evaporated over the last million years or so, leaving behind core building blocks that are rich only in leftover carbon and rocky materials. "These systems appear to be building planets we don't see in our solar system—large multi-Earth mass ones with variable amounts of ice, rock and refractory organics," Lisse said. "This is very much like the predicted recipe for the super-Earths seen in abundance in the Kepler planet survey." "Much still has to happen, though, before these rings could become planets the size of the gas giants," he continued. "Why it's taking so long to make outer planets in these systems—after their primordial gas disks have been stripped away—is a big mystery." Like our science discoveries, there seems to be more than one way to get the job done. Were the outer gas giants original productions of Sol? As our star evolved, the inner metalized planets also produced by Sol but under different solar configuration? Did one of these iron based planets shatter? and produce the asteroid belt? And the comets we see acquired by the gas giants? These comets and asteroids would then be almost constant factors in the inner planets orbits. Were ALL of these planets original 'gas spheres' produced by our sun Sol progressing along from super giant to dwarf?